"Burst of Light: Caravaggio and His Legacy" an exhibition demonstrating the lasting legacy of the infamous artist on 17th century art has traveled across the country from the Los Angeles County Museum of Art to the Wadsworth Antheneum in Connecticut, a much smaller collection but noteworthy nonetheless. 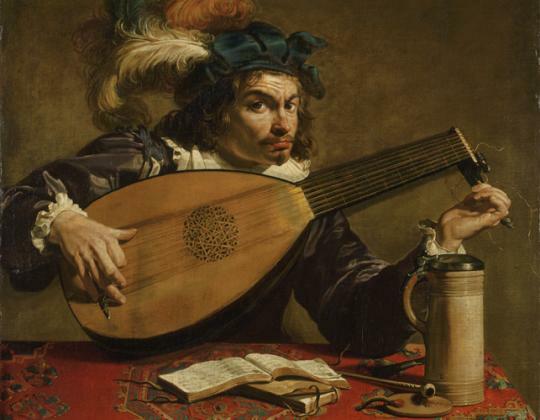 As with any show of this magnitude foreign loans are a major issue which are missing except for two loans from the National Gallery in London and the National Gallery of Canada in the Wadsworth exhibit. The show includes five paintings by Caravaggio which are hung in the first of three galleries. 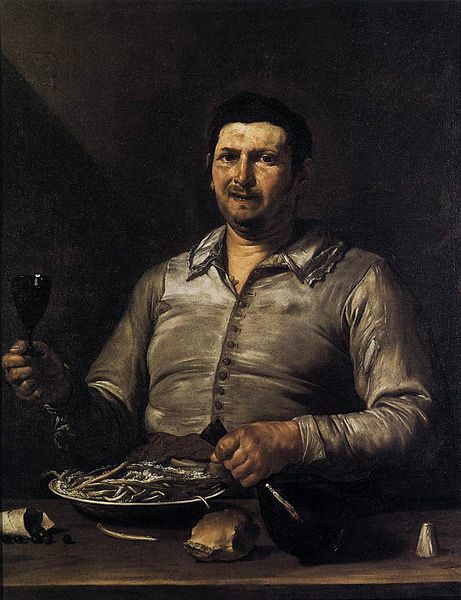 Also in the first gallery are those artists who were Caravaggio's contemporaries or those artists that worked alongside him. 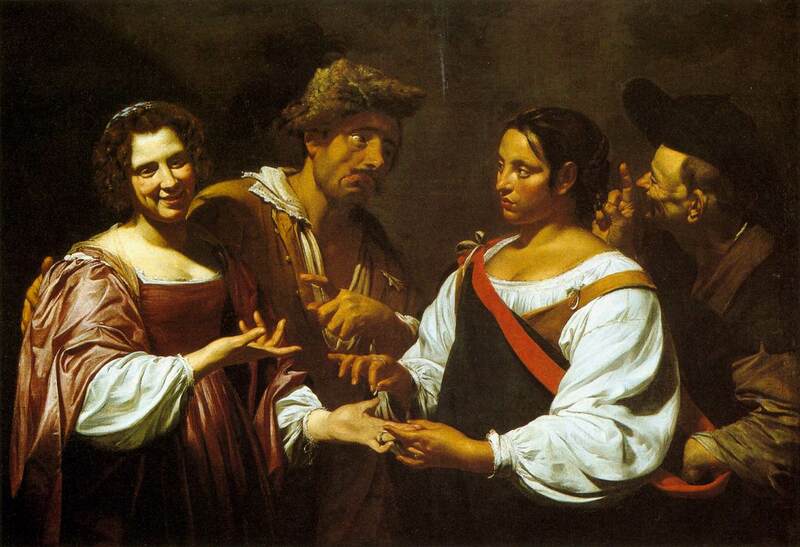 The 'Caravaggisti' as his followers are known are divided into two galleries according to their geographic location. There is an audio guide for the exhibition which is accessed through a phone line. For you to enjoy the exhibition as any other visitor can do at the Wadsworth I am including the telephone number 1-860-760-9980 and the numbers on the works of art. Just dial this number from any phone and punch in the numbers on the paintings followed by the pound key. The main number for the overview of the exhibition is 300#. As soon as visitors enter the main gallery of the exhibition they are confronted with a half-clad, young Saint John the Baptist, commanding attention in the middle of the facing wall. 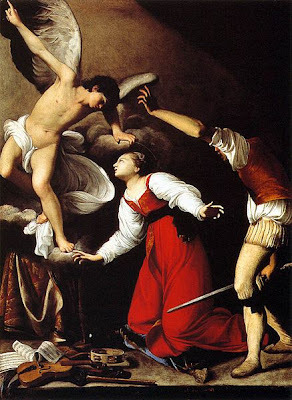 This painting is everything one expects from the infamous Michelangelo Merisi da Caravaggio - he is a full-length figure pushed to the front of the picture plane with a dark background that helps to project the figure into the viewer's space and a strong light coming from the top left. It is even possible to see the incisions above the right knee. 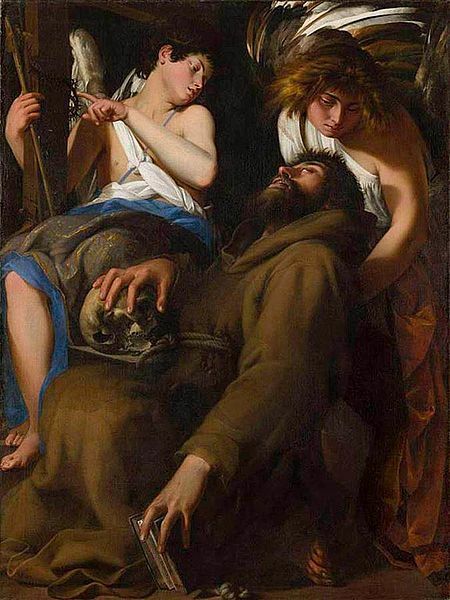 This painting is flanked on both sides with two smaller, more intimate works - Martha and Mary Magdalene to the left and Saint Francis of Assisi Ecstasy to the right. 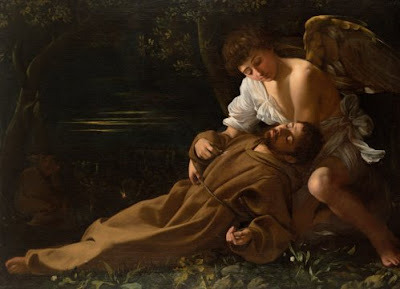 While it is interesting to note the artist's evolving style starting with his earliest work on show Saint Francis of Assisi Ecstasy, it is also important to note the dialog of this painting to The Ecstacy of Saint Franscis by his nemesis Giovanni Baglione hanging on the wall next to it; it is proposed that Baglione probably painted his Saint Francis as a reaction to the Caravaggio painting which he would have definitely been familiar with. Carlo Saraceni's The Martyrdom of Saint Cecilia, is displayed in this gallery with its angel directly recalling Caravaggio's Amor Vincet Omnia from the Gemaldegalerie in Berlin. Unfortunately this painting was not included in the exhibition but a reference was made to it in the gallery label. 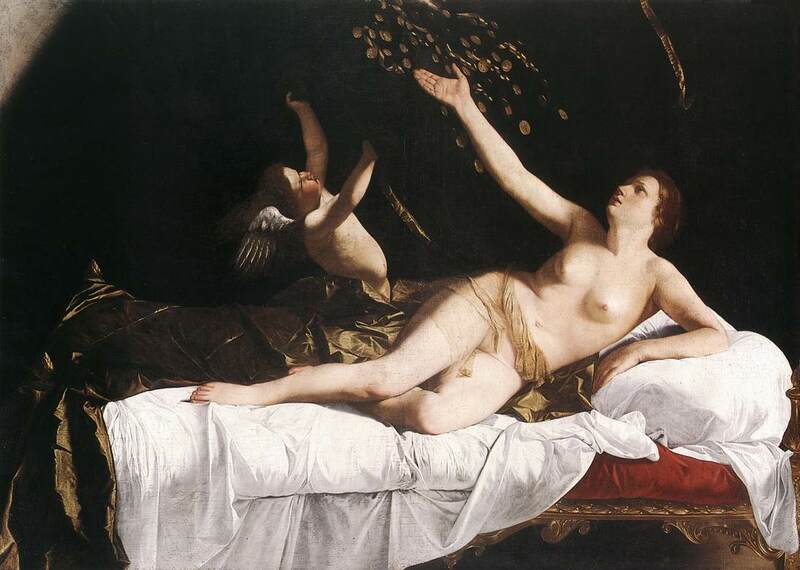 Orazio Gentileschi was an artist who worked closely with Caravaggio and was influenced by the artist's use of the live model. 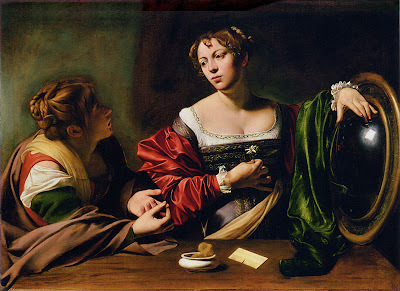 Seeing two of Orazio Gentileschi's paintings hanging on the opposite wall from Carvaggio's works, made me seek out his daughter Artemisia Gentileschi's paintings that definitely bear the Caravaggio effect. 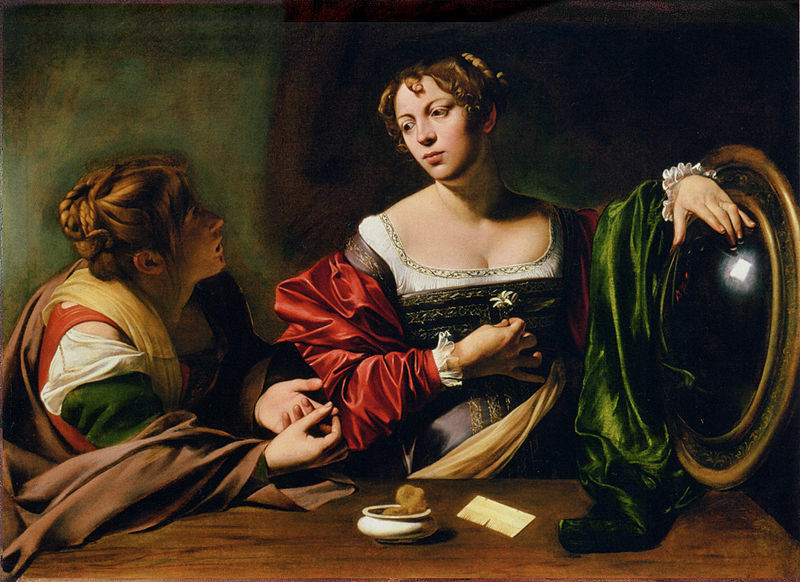 I was sadly disappointed to find that although she definitely belonged in this show, Artemisia Gentileschi was not represented among Carvaggio's contemporaries or followers. 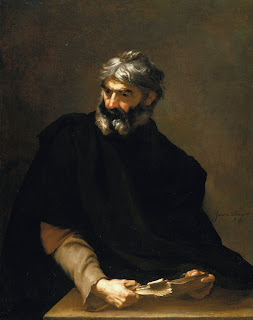 Of the five Caravaggio's on display, the one lent by the Metropolitan Museum of Art, The Denial of Saint Peter, is supposed to be there for the first half of the exhibition. It is also a great painting to see the last phase of Caravaggio's work, he was supposed to have painted this the year he died. The black of the background can be seen coming through the light layer of paint applied in the hands and head of Saint Peter. The exhibition space to the left of the main gallery held works by various Italian and Spanish artists including Carlo Saraceni, Jusepe de Ribera, Orazio Riminaldi, Barolomeo Manfredi and Francisco de Zurbaran. For the most part it seemed like a collection composed of works recalling typical Caravaggio themes and use of dramatic theatrical lighting. 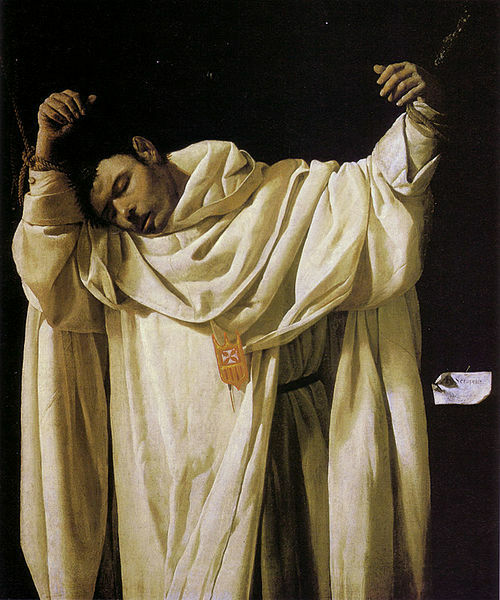 I was happy to see some of my favorite Spanish Golden Age painters present since they seemed to have incorporated Caravaggio's style not just in imitation but as a way to create their own distinctive kind of drama. 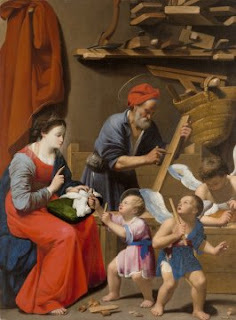 While Jose de Ribera picked up on Caravaggio's depiction of ordinary people from the streets and taverns of the city as well as the dark background in his painting of an allegory, Sense of Taste, Carlo Saraceni in The Holy Family in Saint Joseph's Workshop presented a gentle religious scene with light colors and intricate details but here bringing the everyday lives of the faithful into a religious scene is appropriated as the Caravaggio effect. One of the things I was most curious about prior to arriving at the exhibit was how the paintings, most of which were supposed to be used in dark interiors amplifying their dramatic effect, would be displayed in the museum setting. Sadly, Saint Serapion, by Zurbaran, a most intense work that was supposed to hang in the funerary chapel of a monastery is Seville, had lost some of its impact due to the lighting in the gallery but I could capture some of what I was looking for in Ribera's Protagoras which was not even displayed in the main galleries but in the reading room off to the side. It was a dark quite interior which further accentuated the power of the painting as well as provided a more intimate experience which I always imagine the monks must have had with Saint Serapion. The room to the right of the main gallery included French, Dutch and Flemish artists including Georges de La Tour, Geritt van Honthorst, Gerard Seghers, Simon Vouet and Theodoor Rombouts. 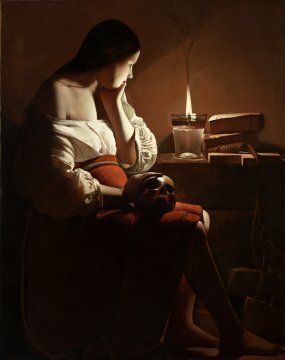 Although Caravaggesque themes and lighting effects were also present in these paintings, the use of candles or an observable light source set them apart from the rest. In this gallery was the famous The Magdelen with Smoking Flame by Georges de la Tour, a painting that not only translates her state of reflection but also come alive, illuminating the space beyond the picture frame. 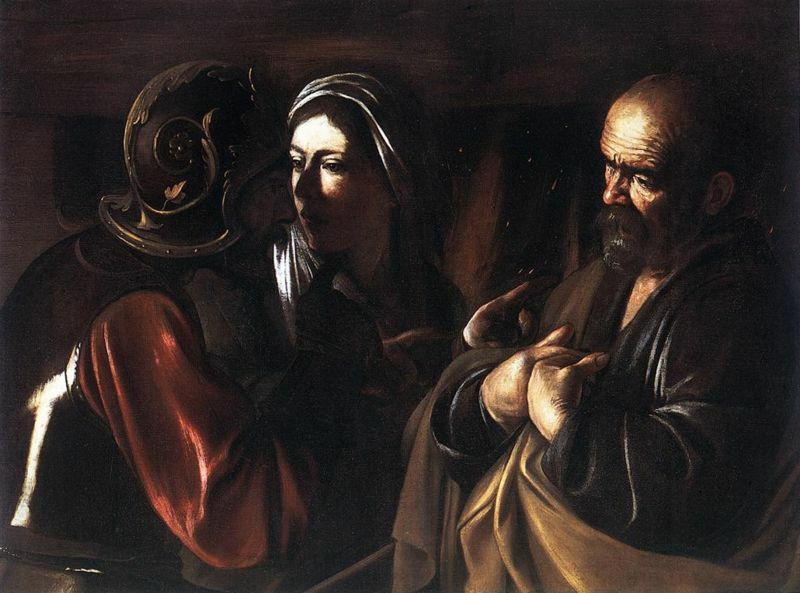 The Caravaggio exhibit at the Wadsworth Antheneum is definitely worth a visit. 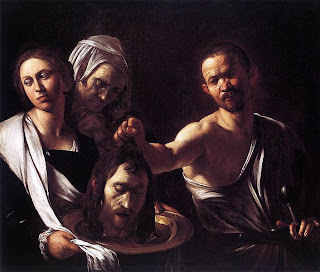 Besides seeing five Caravaggio's in the same room, which in itself is a pretty rare occurrence, it is a great way to observe the great master's influence carry over to other influential artist's works. There is another BIG plus to visiting the exhibit at the Wadsworth - their new acquisition of Bill Viola's Ascension. 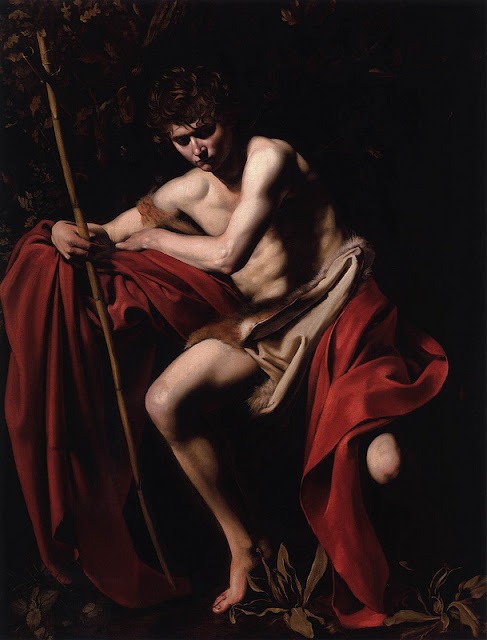 Sitting in a dark room for ten minutes and experiencing this video installation complements the Caravaggio exhibit perfectly and completes his circle of influence extending the affects of the masterpieces observed upstairs into our present day. Ascension (2000) from Wadsworth Atheneum on Vimeo. Thanks, Sedef! It looks like a breathtaking show. And it is amazing how the first great baroque collection in America sprang up in Hartford. I, too, am always curious about issues of exhibition installation. 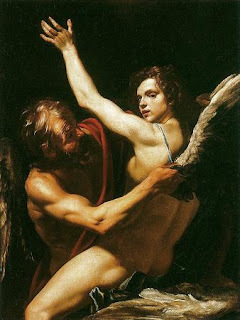 Not only is the lighting usually wrong for baroque pictures but they are almost always hung too low. A stunning exception was the recentish "Rome in the Age of Caravaggio" show at Palazzo Venezia--where they built an altar with a full architectural surround for each big altarpiece. It was wonderful, but I doubt that we will again see anything that luxurious any time soon! Ed G.
Thank you for this superlative review Sedef, and for including the Ascension video, which really does remind me of the equally hypnotic Chris Cunningham directed "Only You" video for Portishead, released in 1998. 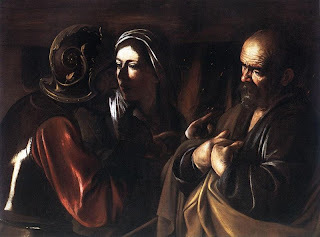 It is always a dizzying and sombre experience to view a Caravaggio in person, an effect which his followers were able to capture in certain examples - some of which are definitely included here! Though I agree, a great shame they did not include Artemisia. How intriguing that the Wadsworth is using the phone guide - I could not access it from here (Australia) but would be interested to hear it. I guess this may have been cheaper to implement locally then release it as an museum app? Did you encounter an exhibition catalogue? I am curious to know if there was one, and what it contained. Many kind regards, and well done. The writing and images presented are of wonderful quality - a great treat for us all. What a beautiful set of images. Thank you for this. 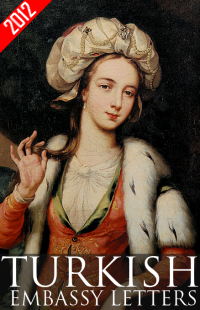 As for Artemisia, even now she is disparaged and thought of as a 2nd rate artist by some curators and art critics. Male chauvinism toward women artists dies hard. What a great review, Sedef! Many of the pieces that you mentioned were in the "Caravaggio and His Followers" exhibition that I saw at the Kimbell Art Museum about a year and a half ago. Interestingly, in that exhibition the "John the Baptist" painting was also the central painting to draw the viewers into the gallery space. I appreciate that you analyzed the lighting in the space. 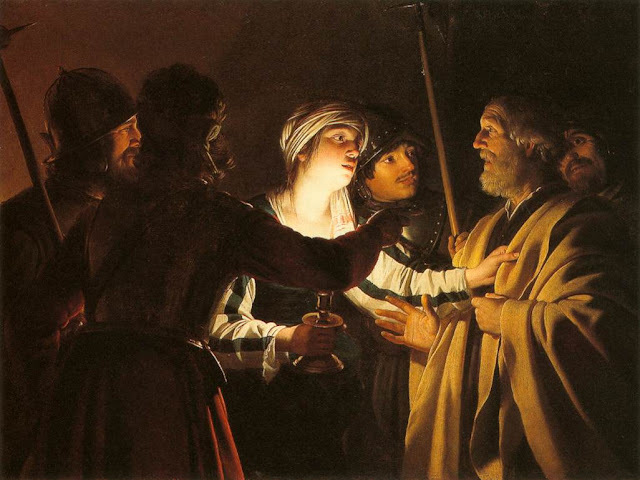 I agree that it must be tricky to consider lighting when curating a show on Caravaggesque art. Do you remember what the colors of the walls looked like throughout the exhibition galleries? Did you feel like the colors of the walls helped to complement the paintings with darker palettes? 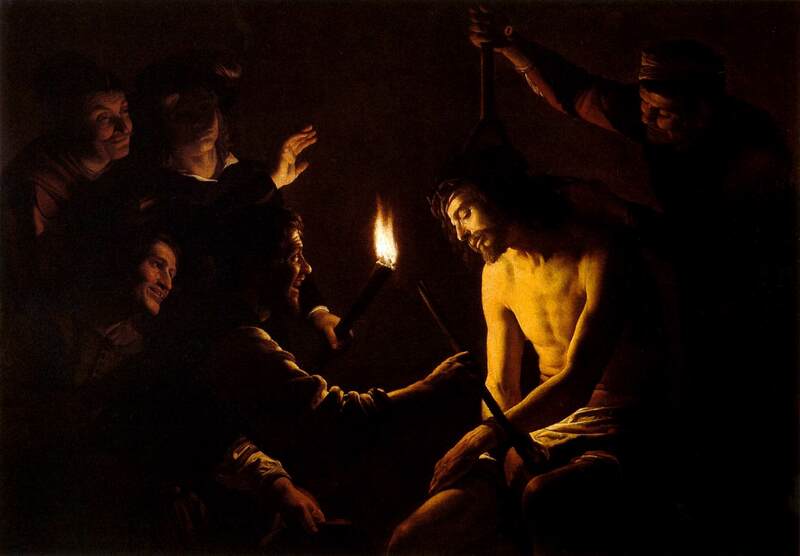 I agree that the Bill Viola installation is a wonderful complement to the Caravaggio show. It is dramatic, spiritual, dark (especially the dark viewing room that you mentioned), and yet uplifting. @Ed G. - It is rather interesting that this exhibition would be in Hartford of all places but as it turns out the Wadsworth is the first museum that is still in operation in the United States (before the Met even! )"Rome in the Age of Caravaggio" show at Palazzo Venezia - sounds dreamy. We can hope that there will be others like it. 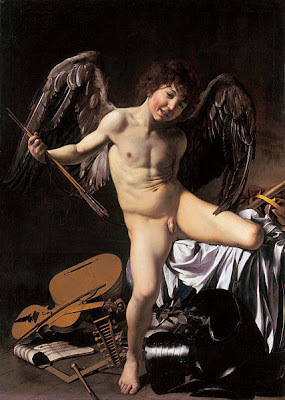 Caravaggio requires the drama more than any other type of art. @Hasan - Thanks for sharing the Chris Cunningham video, it is mesmerizing. There are a lot of museums who are using phone guides now - I can think of the Philadelphia Museum as a start. I like it because then I can listen to it later as well. I realize it is a situation that only benefits those in the US but there is always Skype. There is a great exhibition catalog which is more conclusive than the exhibit at the Wadsworth; it includes the works that were shown at LACMA which was three times as big as this one. @Nancy - All I can say is that I felt Artemisia's absence but it was pointed out that there had recently been an extensive show of her works. It is mind boggling that in this day and age they would still discriminate against her because she was a woman. 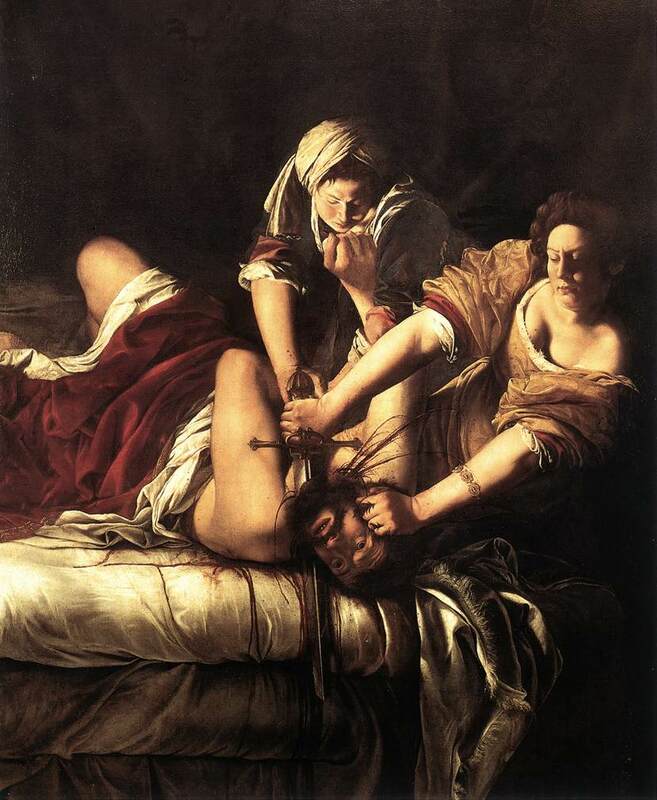 Is it actually true, I wonder, that Artemisia Gentileschi is being discriminated against these days because she is a woman? In fact, I recently had this discussion with a number of museum curators and the consensus was that her "iconic" works are actually rather few in number and there are so many requests for them for exhibitions that they have become almost unborrowable. Meanwhile, there are quite a few large,clunky and "uniconic" Artemisias, especially from her Neapolitan period, that no one ever requests, except for very specialized shows. However, considering that the Wadsworth is the oldest public art museum in America (arguably, since I think that Bowdoin College claims the honor as well) and was collecting baroque painting very early on, it is indeed surprising that they did not pick up an Artemisia along the way, especially since baroque pictures were often relatively inexpensive. I wonder if anyone has tracked the relative prices for Orazio and Artemisia over the last hundred years? Actually I heard something similar regarding the request for her work which is actually the real business of curating isn't it. As in-depth a show as they would like to put together, there is more to determine what is shown in an exhibition than (literally) meets the eye. Wadsworth being the oldest museum is their claim, not mine, so I will take your word over theirs. Sedef--I hate to confuse things even further, but I am now in Philadelphia and yesterday, I visited the Pennsylvania Academy of Fine Arts (wonderful place!) They make quite a point of billing themselves as "the oldest art museum and school in America", founded in 1805. Who knows?! Ed G.